(Bloomberg) -- Some of the world’s dirtiest and densest crudes traditionally spurned for being too difficult to process are having a moment in the sun, with a little help from Donald Trump. “Heavy-sour” oil from nations such as Venezuela and Iraq have a higher sulfur content and are more viscous than “light-sweet” grades pumped in U.S. shale fields and Europe’s North Sea. While the dirtier crudes could usually be bought for a steep discount versus the easier-to-refine types, they have strengthened dramatically over the past few weeks. At least two varieties have flipped to a premium. Their unusual strength has its source in U.S. policy: America’s effective ban on Venezuelan oil has forced Gulf Coast refiners to scramble for alternatives from elsewhere. Trump’s decision to reimpose sanctions on Iran has also shrunk Middle East supplies, most of which are of “medium-sour” quality that are still heavier than light crudes. Cargoes from the region are further being squeezed as Saudi Arabia bears the bulk of output cuts by OPEC. While the Organization of Petroleum Exporting Countries is curbing production in a bid to prevent a worldwide surplus that’s driven by abundant light-oil supplies, the cuts are contributing to a reduction in heavy and medium crudes instead. The effects are reverberating in the price relationship between benchmarks across the world. Just this week, Middle East marker Dubai crude rose to a premium over London’s Brent. That’s after it traded at an average discount of about $2.50 a barrel in 2018, data compiled by Bloomberg show. 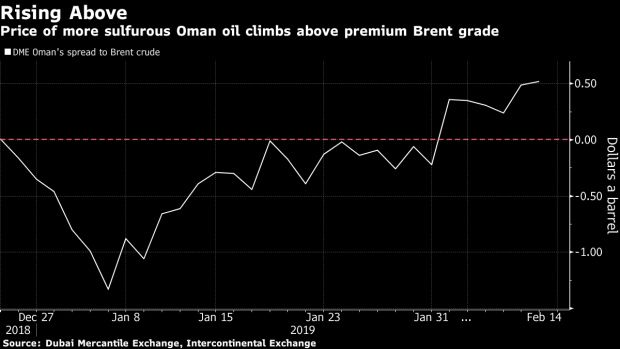 Earlier in the month, another Middle East grade Oman -- which has a higher sulfur content than European oil -- also rose above the London benchmark for the first time since December. It’s now at a premium of about 50 cents, compared with a discount of around $1.50 a barrel in early January. It’s not just Middle East crudes that are strengthening. The premium of Mars oil, pumped in the Gulf of Mexico, versus U.S. West Texas Intermediate jumped to a five-year high this week as domestic refiners sought cargoes to replace Venezuelan shipments. The discount of Western Canadian Select versus WTI has narrowed to about $10 a barrel from $50 in October. In Asia, state-run energy giant PetroChina Co. is selling Venezuelan Merey oil for February at a premium of about $5 a barrel to WTI, according to an offer document seen by Bloomberg. The grade was sold at a discount in the nation before the Trump administration began targeting the OPEC producer late last month in a bid to oust autocrat Nicolas Maduro. Saudi Arabia, OPEC’s largest producer, sent just 415,000 barrels a day of crude oil to the U.S. last week, matching a record-low, according to government data going back to 2010. At the same time, Venezuela shipped only 117,000 barrels a day to its American buyers, an all-time low. Meanwhile, supply from U.S. shale fields -- which typically yield a higher amount of fuels like gasoline and naphtha -- is increasingly making its way to overseas refineries and sparking a surplus of light oil products. That in turn is shrinking refining margins in major consuming regions such as Asia and reducing the incentive for purchases of low-sulfur oil. So while heavy crudes are strengthening due to a shortage, light grades are weakening on slower demand. The outlook for heavy crudes will be determined by the ability of refiners to process them into valuable, low-sulfur products, especially in the second half of this year. That’s because new International Maritime Organization standards limiting the use of highly-polluting fuel will be implemented starting January 2020 in a bid to curb emissions. While many processors in Asia have invested heavily in new facilities or retrofitted existing units to break down heavy-sour oil, others that haven’t made these infrastructural updates are expected to turn away from such grades in favor of light-sweet oil. --With assistance from Sharon Cho, Alfred Cang and Sheela Tobben.